Your favorite antiheroes are here to strike back with another score to settle. each character has his own strengths and skills so pick one and start shooting. In Story Mode, you'll fight through 60 furious levels using an arsenal of upgradeable weapons, tanks, helicopters and turrets or for a quick adrenaline fix, play Rush Mode and see how long you can last. 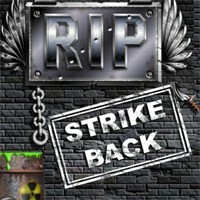 For those who like to shoot, RIP: Strike Back salutes you! query: INSERT INTO accesslog (title, path, url, hostname, uid, timestamp) values('R.I.P: Strike Back', 'node/1260', '', '3.80.224.52', 0, 1556142743) in /home/surelion/public_html/drupal-4.6/includes/database.mysql.inc on line 66.